The mystique of the ancient cities of the Maya have amazed and intrigued us for centuries. This once great nation dominated southern Mexico, Belize, and Guatemala for hundreds of years, before abandoning the great cities around 900AD. Nobody can explain for sure why the cities were abandoned so suddenly, and it remains to this day one of the great mysteries of our time. 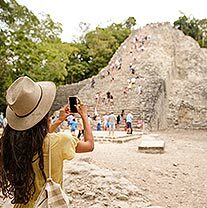 CANCUN'S BIGGEST SELECTION OF MAYAN RUINS TOURS! SAVE UP TO 45% ! SAVE UP TO 56% ! SAVE UP TO 55% ! Some suggest that there was a foreign invasion, others believe that the need for the ceremonial cities was vanquished with religious influences from the North. There are also theories that the agriculture dried up, or that there was a peasant rebellion that overthrew the cities. 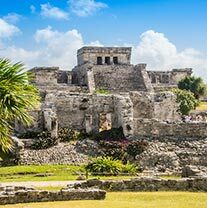 We may never know the real reason that the Mayas abandoned their cities, but we can learn much about this fascinating advanced culture, light years ahead of its time. 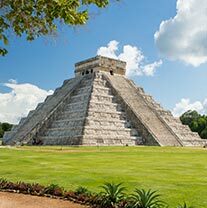 Chichen Itza is the most historically important and impressive of the Mayan Ruins around Cancun. If you only visit one Mayan Ruins site while in Cancun, this should be it. Coba is one of the newest discoveries in the Yucatan. Although it is one of the older Mayan cities, it was discovered until the late 1800s. A favorite of serious travelers, the remote jungle location makes for an Indiana Jones-type feel. 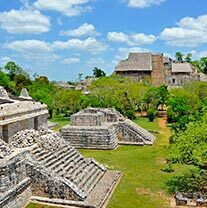 Ek Balam is most well-known for its impressive central plaza, where large and well-preserved ruins exist. Most of the tours to Ek Balam are teamed with adventure tours of the Cenotes like the Ek Balam EcoAdventure. San Gervasio is the largest of the 30 Mayan Ruins sites on Cozumel. It is located seven miles east of San Miguel, and was a religious center for the Mayas until the 16th Century. It is small compared to Chichen Itza and Tulum, but it is worth a visit. Tulum is perhaps the most visited of the Mayan Ruins sites around Cancun, and is often paired with a visit to Xel Ha. It sits perched on the edge of a cliff, overlooking the turquoise waters of the Caribbean...an absolutely breathtaking setting. Xcaret is most well-known for its status as an ecological theme park, with an underground river, lagoon, and dozens of attractions. However, it also houses several Mayan Ruins. You can find them dispersed throughout the jungle in the park. Xel-Ha ruins are across the street from the Xel- Ha Ecological Park, one of the prime snorkeling locations for tourists to the Cancun area. These ruins are rather small, and can be visited in about an hour, before heading back over to the park. The Mayas were mathematicians, astronomers, architects, philosophers, and priests. While Europe was still in the dark ages, they invented the calendar that we use today. They mapped the stars and planets, and built with no tools some of the most magnificent structures the world has ever seen. The astronomical precision of these structures is absolutely breathtaking. We strongly encourage anyone who is visiting Cancun to tour the Mayan Ruins. It is astounding how advanced this society was, and how beautiful it's creations. To get the most of your experience, we urge you to hire a guide, whether a private guide, or as most people do, go with a guided tour. The guides are very knowledgeable and make the experience so much more rewarding. Listed above are the Mayan Ruins of the Cancun area, and the tours that you can take to see them. Click on the links at left to exploreour large selection of Cancun Tours and Activities.